I have always thought photography and winemaking had a lot in common. You need a lot of technical knowledge, but also a passion to create something unique. At a certain level both are a bit like an art or a craft. 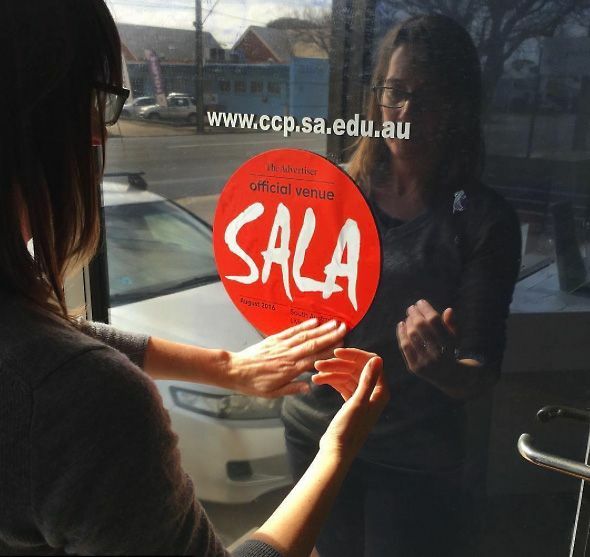 The SALA sign goes up at the CCP. Photo : Alyssa © Cavanagh. Winemaker Kevin Judd in New Zealand combines the two as does Bernie Kaeding at Red Art in the Barossa. 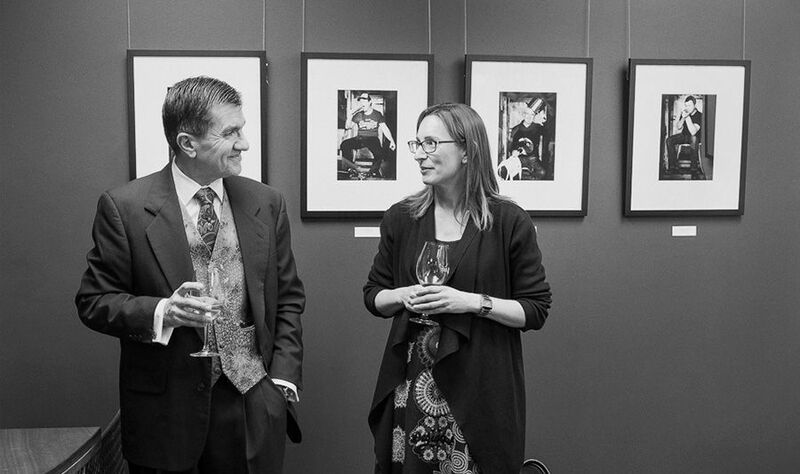 Bernie’s South Australian Living Artist ‘SALA’ show ‘True Stories : Portraits Of Barossa Winemakers’ is hanging at the Centre for Creative Photography : Light gallery during August. Well worth a look if you are in Adelaide. Bernie published a book based on these images. Self publishing is quite an endeavour – many people consider it but only anyone who has actually done it would know what is involved. 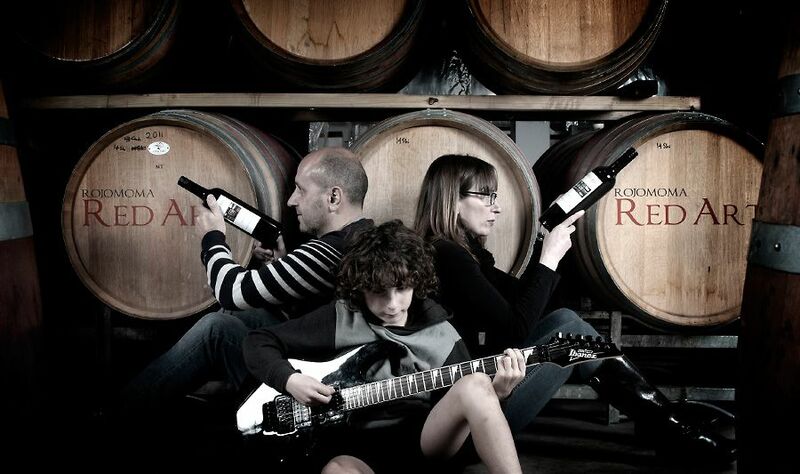 What’s your current role at Red Art Wines ? Sam and I work together, we do pretty much everything at Red Art. Whether it’s pruning in the vineyard, picking during vintage, wine making, designing the labels, sales, the accounts, marketing stuff like organising events everything… We are very small, producing about 400 cases from our tiny 5ha single vineyard in the Ebenezer region. The original Barossa Topographical map. Ebenezer is circled in red. 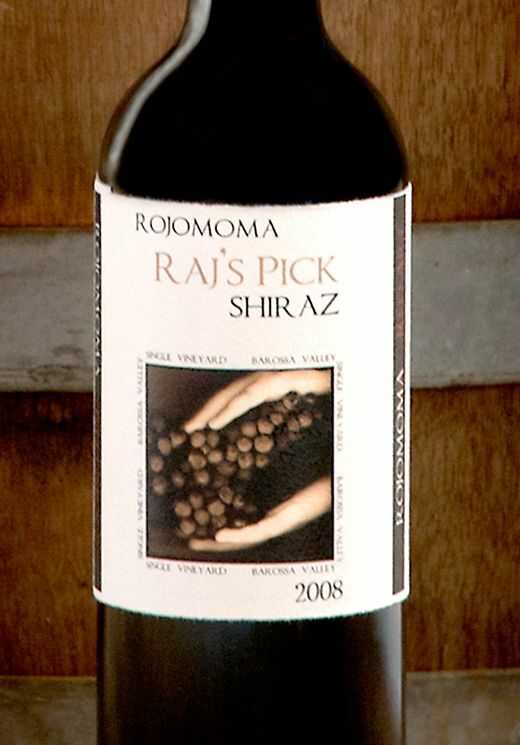 Image courtesy of the Barossa Grape & Wine Association. How did you get involved in the wine business ? I did a commerce degree at Flinders University. During the course we had this subject called ‘Business policy and strategic planning’. It was all quite new at that time. I was involved in a group that worked with BRL Hardy. It was one of the best things I’d ever done. Stephen Millar, CEO of BRL-Hardy. Not only was it really practical, we also got to interview the people who worked there, like the Managing Director, Stephen Millar. After we spoke to Stephen we came up with this huge strategic plan for the business. He then marked the papers and gave us comments. It was really practical… I found too often at University it was all theoretical, so this subject was just wonderful. I thought this is it for me, I really wanted to move into the wine industry. I got a job at Telstra and started studying wine marketing as an external student. Luckily I got a job at Orlando and moved to the Barossa. That’s where I met Sam, he was a winemaker there. I’ve been here in the Barossa for 20 years. Not sure I’m a real ‘Barossan’ yet, maybe next year. I’m not a trained winemaker, I’ve learnt it on the job with Sam. I was born in Townsville. Dad was in the airforce. I was six months old when he got a job with NASA (National American Space Agency) and we moved to Canberra. A few years later we moved to the Adelaide Hills. I’ve been in South Australia ever since. Gavin Blake CCP director, opened the exhibition in the Light Gallery. Photo : Alyssa © Cavanagh. How did you get involved in photography ? I studied photography at high school. It was an elective thing and I just fell in love with photography. One of my art teachers once wrote in my report card, “she lacks the ability to draw” so I never thought I’d make it into a career or do it in a serious way. I was here establishing our vineyard after I had left Orlando, I’d had a break from the normal daily routine of a nine to five job. I thought ‘I am in a lucky position where I can explore whatever I want’… I loved photography so I did some research and signed up with Gavin at the Centre for Creative Photography (CCP). I liked their approach to things, they talk more about the creative side rather than the technical stuff. Do you see any similarities between winemaking and photography ? I see quite a lot of similarities. I’m not a technical photographer I do a lot of things by gut feel. 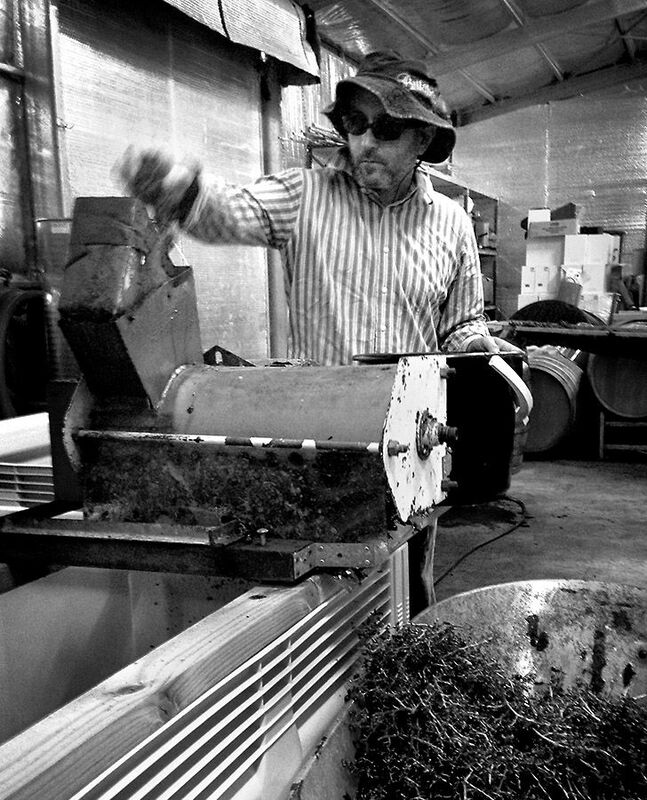 Its the same when I make wine with Sam – it’s driven by inspiration and a feeling, with a bit of technical knowledge. In both winemaking and photography you need a knowledge of the technical things, but then the art and the feeling can take over. Both endeavours really are a bit like a craft. I think Sam and I work very well together, he has a creative mind but he’s a lot more maths and science based, whereas I’m more creative. I understand the need for the maths and science and together we balance each other out. When we make the wine and are blending we make all those decisions together. We don’t always agree at the beginning…but in the end we always agree. It sometimes takes us to another place, and that’s okay. We do everything here in our small winery, everything except bottling. 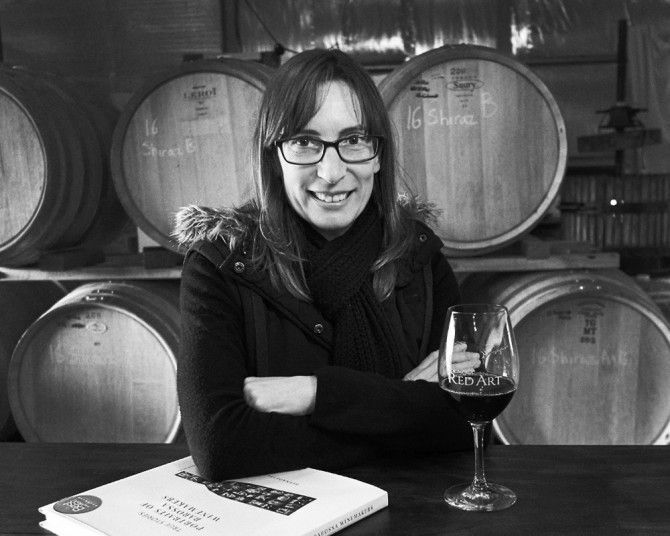 Your exhibition ‘Portraits of Barossa Winemakers’ is hanging at the Centre for Creative Photography for the South Australian Living Artist ( SALA) Festival, what’s the back label to the exhibition ? When I was selling our wine I realised people were interested in us as people as well as the wine we made. 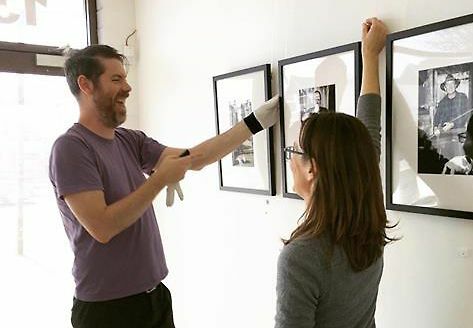 Ross McNaughtan helps Bernie hang the SALA exhibition at the CCP ‘Light Gallery’. Photo : Alyssa © Cavanagh. That’s partly because in any small business your product is really an extension of who you are. At the same time as I was thinking about this connection, I was getting calls from winemaker friends asking me to take a portrait of them for public relations. I did some portraits, but it didn’t seem right. I didn’t really feel it was my strength. I’d finished a basic photographic course at the CCP, but this was very different. Around this time Gavin rang to tell me about a portrait class the CCP was planning. I said yes straight away. So then I guess these two ideas came together – people wanting to know the person behind the brand and people wanting to push me to do the portraiture. At the end of the CCP portrait course I had to do a series of six portraits. So I started with my self portrait and did five others of friends. I asked them to bring in something they were passionate about instead of their wine as a prop, and I shot them all in our shed with the same bold timber door as a background. When I put those six images together I realised they were really telling a story of the culture of the wine industry here. Individually the images tell you something about who that person is, but together it tells an even bigger story of our region, and I really just enjoyed talking to the winemakers and having them share their stories. Barossa vintage festival exhibition in the Red Art winery. Photo : Bernadette © Kaeding. From those first six images I thought I’d expand it and have an exhibition. I just loved talking to these people, some I didn’t really know. The more I got into it, the more I thought ….if I find this fascinating I’m sure others would as well. I set a deadline to launch the project at the Barossa Vintage Festival in April 2015 with a series of lunches in our winery. We had four lunches, at each lunch four or five of the winemakers in the exhibition joined us. It worked out really well, it was great fun. I’m glad I set a deadline even though I often regretted it, but if I hadn’t I’d probably still be working to finish it. You published the book, tell us about it ? Not sure I want to do it again, but it’s a very handy marketing tool. 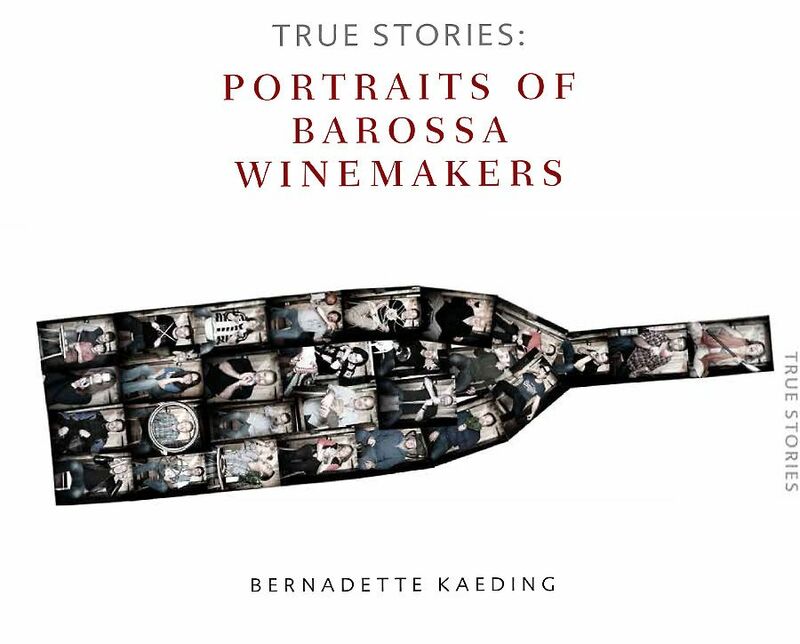 ‘Portraits of Barossa Winemakers’ book cover. I’d never intended to publish a book but when I was working on the exhibition – the images and the stories all seemed to come together. So the exhibition grew into a book. Together, the winemakers and I did it, the book that is. I wrote a little bit and the winemakers in the portraits contributed their bit. It took about a year to pull it all together. 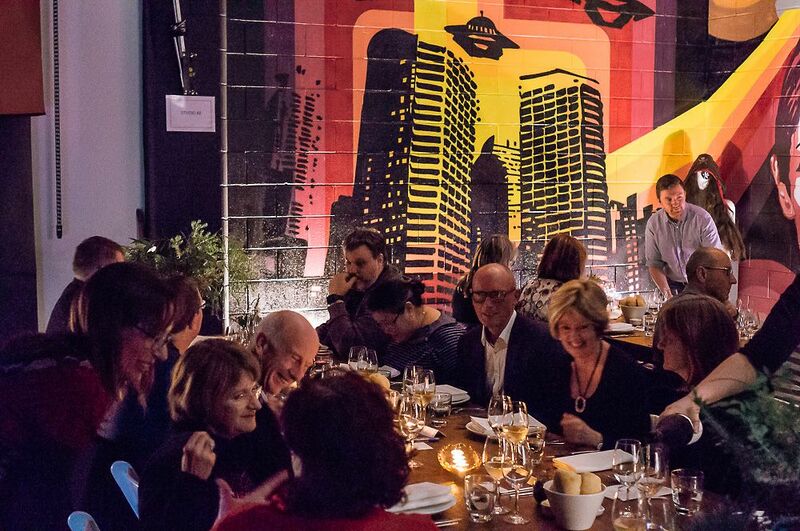 We won the ‘Best writing in the wine book’ category in the Australian section of the International Gourmand Wine and Cookbook Awards and went on to get a bronze award in the ‘Best in the World’ Gourmand Awards which were announced early this year in Yantai, China. Seems very funny as I entered as a photographer. 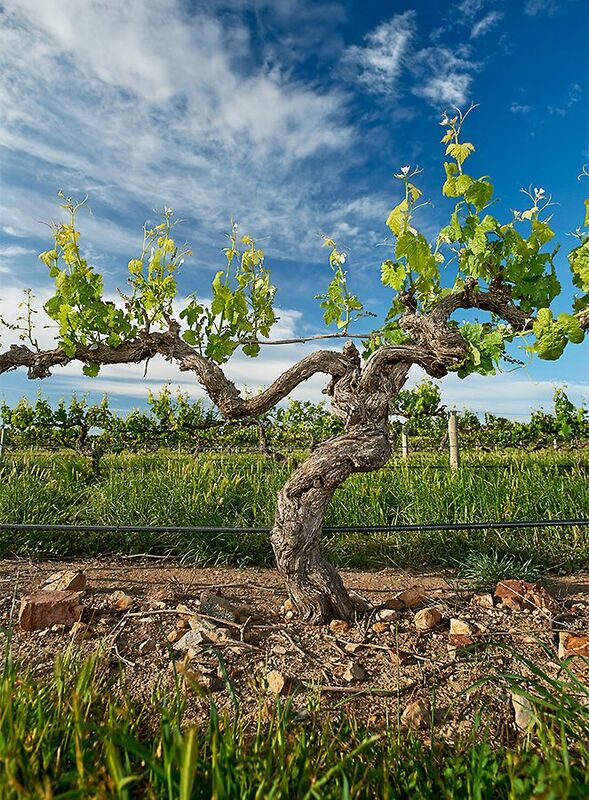 Your vineyards are in Ebenezer, what’s special about this part of the Barossa ? Original ninety year old grenache bush vine. Photo : Bernadette © Kaeding. We only source fruit from our single vineyard. This is a tough area for the vines. I think that’s what helps to create small berries with really intense flavours. There’s some big strong powerful tannins, but it’s a matter of how we deal with those. We try to take a more elegant approach. We try not to let the bigness takeover. We could produce something with massive alcohol and heaps of tannin, but we’re after balance and elegance. Our ‘Old Vine Grenache’ vines were already here when we bought the block. We think they are about 90 years old. Dry grown… you just prune them and pick them. The soil structure is good, it takes a while for those roots to get down through the clay and calcrete, but once they do they produce wines of great stability. I don’t want to jinx us (touching the wooden table) but I think we are in a little protected patch here. When you get really extreme weather, our vineyard seems to just go through it. Nearby neighbour. Penfolds famous Kalimna Block 3C. Photo : Milton © Wordley. We are right next door to and very similar to Kalimna (1km to the west). Some of the best patches have the same sandy loam over clay soil like us. That’s one of the reasons we came here, Kalimna has very old vines that have proven themselves. 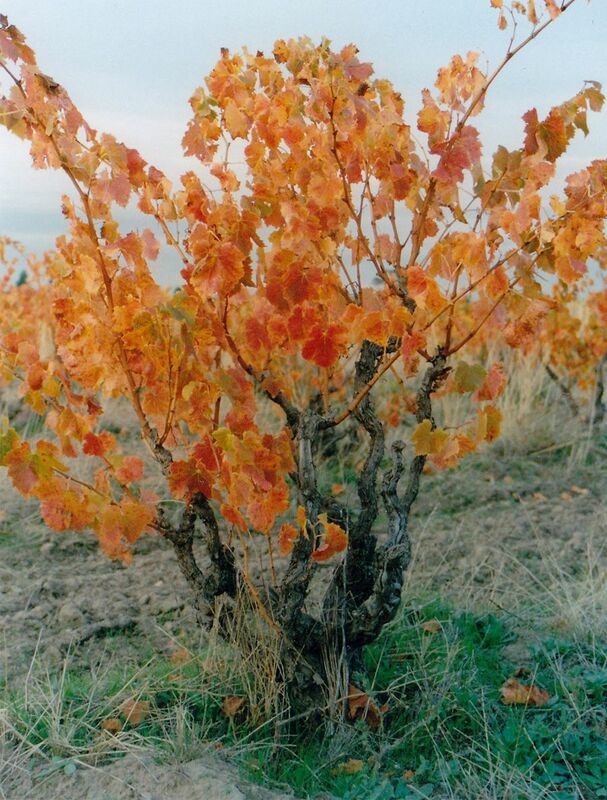 These vines have a history in these ancient soils, they have consistently been producing amazing fruit for so long. We picked this area to buy a block, and got very lucky that a block came up that we could afford. It was part of a bigger property founded by Elmore Shultz. The property was broken up after he passed away. Luckily for us they subdivided this small patch and we bought it. People who visit us here say.. “It must be so romantic being in the wine industry on this beautiful patch of land… doing all this stuff” and you’re standing near the highway with all the big noisy semis driving past all day long….. the vines don’t seem to care about the trucks and the land is great, so it’s all good. Other wines from this area ? There’s not a lot of other wineries near us and there are not very many people making pure Ebenezer wines. The classic is Barossa Valley Estate’s ‘E & E’ Black Pepper Shiraz, named after two of the founding German growers in the area; Elmor Roehr and Elmore Shultz. Your brand name is Red Art, what’s the story behind that name ? I forget, I think it just happened. I remember we struggled with a name. So we thought rather than creating something from our own names, we wanted something that represented us and what we’re doing here. We only grow red grapes and only make red wine, and art is our other passion. Do you see winemaking as a science or an art ? I like to think you do see art in our winemaking, and I think a wine that is made purely on science, doesn’t reflect what we think is really important. The wine has to show the story and the personality of the vineyard, the personality of who grows the grapes, the personality of the person who made the wine, that’s my concept of terroir. I like to think our wines have personality, they have a good backbone, they are strong and structural, and they know what they want to do… but they are still elegant and not domineering. We found having our own business and doing everything from growing the grapes, making the wine, everything including selling that our wines don’t have to look the same every year . It’s a matter of what is best in any particular year. 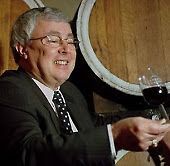 My favourite style of wine is a structural one …with a solid structure in length, then definitely overall… elegance is my thing, I really steer away from big alcohol, big oak, big tannins, I like a wine I can happily sit and drink a glass of. I love old whites, especially old Eden Valley rieslings. But I find myself tending more towards your medium weight wines, especially the Italian or Spanish varieties. I guess right now things are okay, it feels like all these years of work are all sort of coming together. My art and our wine business are together. Like having the exhibition opening and dinner at the CCP the other night. Exhibtion opening dinner at the CCP with Red Art and Michael Hall wines. Photo : Alyssa © Cavanagh. 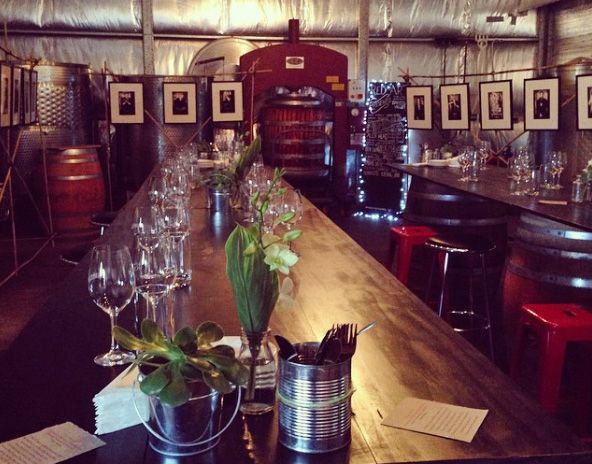 It brings the wine and the art together all in the same place. To me they are so intricately involved and connected.